This comfortable and well-equipped apartment is located on the building ground floor. It is completely independent and boasts a large gallery and a lovely garden. The apartment is ideally located for visiting the Basse-Terre attractions; it is close to La Soufrière Volcano, numerous rivers, Dolé thermal baths, Rivière-Sans Beach, and only 15 minutes away from the ferry to Les Saintes. As a welcome gift, a light dinner will be offered the evening of your arrival, as well as your first breakfast (for stays of at least one week). Behind the house, there is a courtyard where the children can discover ducks, chickens, roosters, and rabbits. Our stay at this house was a delight. Chantal and her mother welcomed our family of 6 warmly, with a lovely Creole supper and breakfast supplies to ease the transition from our long travels. We felt very comfortable in the 3 bedrooms, and especially in the spacious living room, beautiful new kitchen overlooking the sea, large porch area, and the fabulous 2 bathrooms, decorated with real imagination and an artful eye to detail. Chantal went above and beyond in pointing out historic sights and pre-revolutionary houses for us to explore. She is very knowledgeable and friendly. 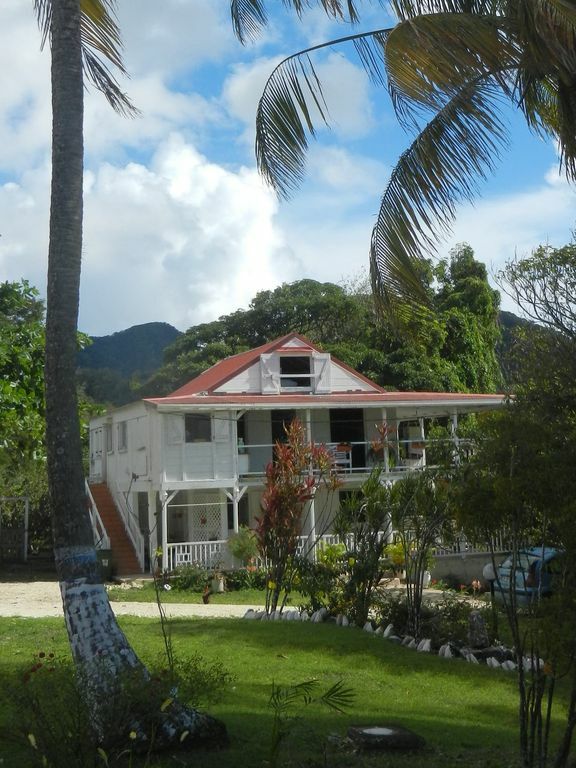 The property is conveniently located between mountains and sea. It’s wonderfully quiet, yet near many places for groceries, hiking, swimming, etc. We made an easy day trip to Grande Terre, to see the other side of the island. The famous beaches of Deshaies are also easily accessible for a day trip. Our elderly parents loved sitting on the porch watching the weather, the chickens and other birds, and gathering for dinner at the handsome table. Our college-age kids loved going down to the lighthouse, about 10 drive minutes away, where we dove off cliffs, had a drink at the bar and enjoyed the sunset over the Caribbean Sea. We intend to return for repeat stays. There is so much to see and do in beautiful Guadeloupe and this house provided the perfect staging ground, accessible to everything. Merci beaucoup, Huguette and Chantal! If you are in love with rain forests, then this is gem to be explored! The house is in the middle of rain forest, it never gets too hot, which makes it perfect for getting a good rest without using AC. It has all the necessities, full kitchen, washer and dryer which we absolutely needed after hiking all over the forest, volcano, waterfalls! Chantal, the host, is absolutely amazing. I highly recommend this sweet house. It was 5 of us, so it's good either for families or groups of friends!! Super gelegen für Trips zu den Wasserfällen und dem Vulkan. Für unseren Geschmack war das Haus etwas zu hellhörig, im Obergeschoss wohnt die Mutter der Eigentümerin. Man hörte jedes Stuhlrücken. Viele lustige Details im Haus, wie zum Beispiel Waschmaschinentüren als Fenster im Bad. Très grande propriété, avec un super cadre ,propriétaire très sympathique ! Malgré notre arrivée tardive avons été accueillis avec le sourire avec en plus un plat local avait été cuisiné par les soins de la maman de Chantal qu’ on Remercie ! Bref Une adresse que je conseil! Très bon accueil, une famille qui est de bons conseils pour les visites et excursions. Une propriété dans un cadre charmant, à proximité de la Soufriere et de petites anses (Dupuy) pour la baignade. L hébergement est spacieux (6 couchages possibles),propre et une décoration originale et créative agremente les deux salles de bains. Nous avons passés trois semaines parfaites! Nous avons passé un très bon séjour à la casa lambi. Maison typique et très agréable ou il ne manque rien. Merci à Chantal et sa maman !!! !